Dr Dawn Bearden is our Optometrist at Fort Lauderdale Eye Care and Eyewear and she is highly skilled at handling emergency eye care and urgent eye conditions. If you are having an urgent eye concern – please call our office at 954-763-2842 ASAP. Often patients will come in with a RED EYE. Red, irritated eyes, although can all look the same, they can be caused by a number of conditions. One common condition is “pinkeye” which is conjunctivitis. Conjunctivitis is an eye infection and it is usually highly contagious. Often it can be caused by being in close contact with another person who has pink eye OR if the patient who has the conjuncitivitis has been recently sick with a cold or the flu. Dr Bearden usually will prescribe antibiotic eye drops and also tell the patient to use artificial tears or eye lubricants often. The patient must also use good “eye hygeine” and not touch their eyes, do not share pillows, face towels or make-up and they must wash their hands often to help prevent the spread of conjuncivitis to others. Another cause of a red eye can happen when someone gets something in the eye (acually ON the eye or UNDER the lid), if someone gets a chemical into their eye or something scratches the eye. This causes a corneal abrasion. This can often occur when doing yard work, when at the beach on a windy day, someone may scratch their eye with a fingernail or eye make-up etc. If there is something in the eye, Dr Bearden will find it and remove it and then treat the corneal abrasion with antibiotic eye drops and eye lubrication so the eye does not get infected. Often the Doctor will use an orange dye in the eye to check for corneal abrasions. 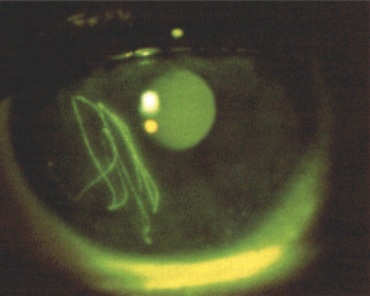 If the cornea is scratched – it will glow bright green in the area of the abrasion (see above photo) when she shines a special blue light into the eye. If you get a chemical into your eye – wash out the eye with eye wash or water for at least 15-30 minutes (AS LONG AS YOU CAN!!) until you can get in to see the Doctor ASAP!!! Dr Bearden would treat the uveitis with several types of eye drops to calm the inflammation and decrease the eye pain. If this eye inflammation has occured more than once – then she would have to investigate to see if there is any underlying systemic problem like those listed above that the patient may be unaware of. Severe uveitis may have complications like glaucoma or cataracts so this would need to be managed also. Another cause of red, painful eye can be a corneal ulcer. These are often seen in patients who wear contact lenses. Dr Bearden sees this A LOT in patients who sleep in their contact lenses and overwear their contact lenses (ex: keeping a two week disposable contact lens for 3,4,6,8 weeks or more). 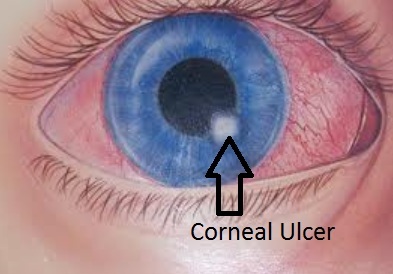 Corneal ulcers can cause scarring of the front of the eye called the cornea. If the ulcer is in the center of the cornea – a cornea scar in this area can cause permenant vision blur. These corneal ulcers must be treated immediately and very aggressively – usually Dr Bearden will prescribe a very strong antibiotic eye drop and have the patient use this every 15-30 minutes! She will also see these patients every day for follow up until the ulcer is under control and not vision threatening. 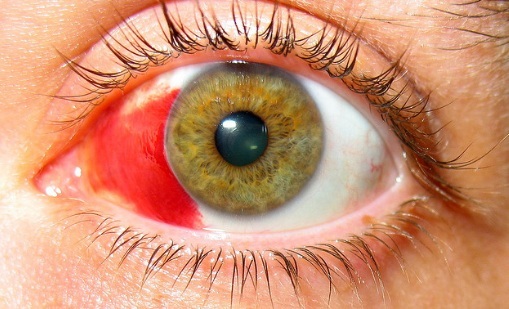 Another common cause of red eye is a Subconjunctival Hemorrhage. It is just caused by a bursted blood vessel. When broken, these vessels bleed and spread out underneath the conjunctiva. Subconjunctival hemorrhage can be caused by sneezing, coughing, straining, vomiting, trauma, high blood pressure, diabetes and sometimes from certain blood disorders or in patients taking blood thinners (like Coumadin or Plavix) or aspirin. Usually these will just resolve on their own in a few days to a few weeks – depending on how large they are. Some investigation must be done into possbile systemic causes like a blood disorder, high blood pressure etc. There are lots of other causes of red eye – including angle closure glaucoma (which is a is a serious medical emergency that must be treated immediately. This serious type of glaucoma causes painful redness that usually occurs in one eye. 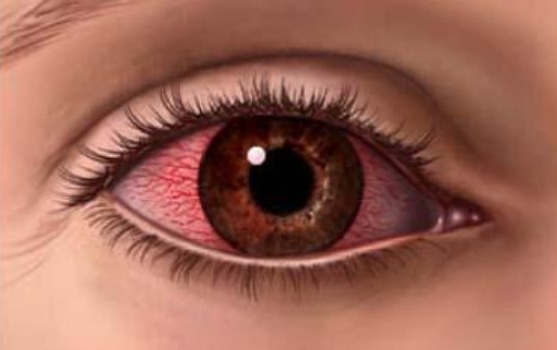 Other non urgent causes of red eye can include: blepharitis, frequent use of “eye whitening” eyedrops (Like Visine, Murine, etc), dry eye and more. If you have a red eye – it can be caused by a variety of different reasons – all of which require different treatments. Call our office immediately if you develop any type of red eye or eye pain 954-763-2842. Another eye emergency is retinal detachment or retinal tear. These can often cause no symptoms and are frequently caught during a routine dilated eye exam. So this is why it is important to get an ANNUAL eye exam – even if you do not need glasses!! Sometimes patients DO get symptoms from a retinal detachment like flashes of light, floating spots or a “curtain” coming up or down over the vision. Retinal detachments can be vision threatening so, if you ever have any of these symptoms – please call our office IMMEDIATELY at 954-763-2842.